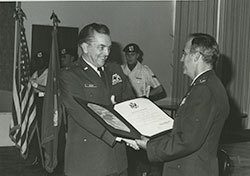 Miller at his retirement ceremony in October 1982, receiving the Legion of Merit, the highest civilian award from the Department of Defense. I credit the Law Degree that I received at Albany Law School in 1951 as one of the most important events in my life. It not only provided me with a sound legal education, but it also convinced me that I could compete successfully against others. I was born in 1924, in Au Sable Forks, N.Y., a paper-mill town in the Adirondacks. My father was the town Constable. Our residence in this town of 2,000 residents was on the third floor of an apartment house in town. When I was a year-old, a town fire leveled 47 buildings, including our apartment house. Fortunately, we were not home that night. In the new residence, we had neither water nor electricity, so we had to go outside to a well and outhouse. We had kerosene lamps, a small kitchen stove and a wood stove. Heat for the two bedrooms on the second floor was provided by the stove pipe which passed up through the center of the building. Most of our food every week was furnished by my grandparents who had a farm about 10 miles away and came to town in the earlier days by horse and wagon. Every Saturday they furnished us with vegetables, eggs, butter and sometimes meat. The Depression had commenced in 1929 and I remember my father doing part-time jobs to supplement his meager Constable salary. However, a miracle suddenly occurred in 1931 as my Dad, a WWI veteran, must have felt that he hit the lottery as Franklin Roosevelt, then Governor of New York, convinced the State legislature that State veterans should receive a bonus. Consequently, Dad received a check for $1,500 in 1931, which greatly improved our lives. With the bonus, Dad had enough money to buy an old home on an acre of land bordering the Au Sable River for $900. With the remaining $600, he was able to install a modern bathroom and, during the following year, rebuilt the interior of the house, providing Mom with a beautiful kitchen. We moved into our new and comfortable residence the next year when I was 8 years old. There was never enough extra money for a movie, or even an ice cream cone, so my hopes of ever owning a bicycle was merely a dream. However, when I was 10 years old, I noticed a “Cloverine” ad on the back of a comic book, which showed the picture of a bicycle, among other items, as possible award for those who would sign up and sell their products from door to door. Of course, I immediately applied and a few days later received a small shipment of the suave, along with related products such as toothpaste and shaving cream. However, I realized immediately that I needed a wagon to carry my products while going from house to house in our town. A red wagon was one of the awards available and I quickly acquired it in compensation for my success during the first month of sales. Thinking back, I believe that people who purchased things from me probably realized how hard my Dad was struggling to survive. So, they may have felt sorry for the family of the man who provided them with daily protection and demonstrated their thanks by kindness to me. When I finally qualified for the award of a bicycle from Cloverine about a year later. However, instead of getting a new two wheel bike, which I longed for, I decided instead, to get a beautiful set of dishes for my mother—which in later years were considered valuable as so-called “depression dishes”. At age 12, I started caddying on the local golf course which I continued doing every summer until 16. At that age, I started working every night as a clerks in a General Store. I never got home until about 10:30 pm and also worked on an alternating basis, every Saturday or Sunday. Dad never asked me for financial assistance but I insisted that he take half of any money that I earned while in high school. Other than him, I was the only one in the family with weekly income. I worked 30 hours weekly for $7.50. All of my homework was done at school during “study periods” as I had not time for studying at home. 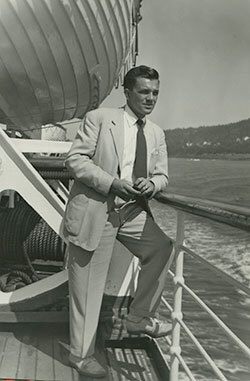 Miller on a trip to Canada in July 1951 after graduating from law school. The word “college” was never mentioned in my home as the only academic goal set for us was graduating from high school, which I did in 1941. My GPA placed me 9th in a class of 51. Only one graduate, the local MD’s daughter, went on to college. World War II started six months later and all the young boys in our town flocked to enlistment offices. However, my parents would not allow me to enlist until I was 18 (March, 1942). Shortly after that day, I enlisted in the Navy and along with 100 other Navy enlistees from Albany, NY, went by train to Great Lakes Naval Training Base on Lack Michigan for basic training. During “boot camp”, we all took general aptitude tests. Shortly after, 20 of us from Albany were notified that we would be sent to a University for training to become Petty Officers. I was selected to become a Morse Code operator and attended the fall semester at nearby Northwestern University in Evanston, Illinois. The fact that I had been in the top 20% selected for college in the Albany group surprised me, however, I’m sure it provided me with some confidence in what was to become the first big academic test of my young life. There were 250 in our class at Northwestern and we were informed at the outset that only 50, (or 20% again), would be promoted to the rank of Petty Office (equivalent of Sgt) upon graduation. That class was comprised of high school scholars from all over the USA and we all wanted to become a Petty Officer so the competition was intense. At the end of the course, I had a 91% average and graduated 33rd in the class. This was a real confidence builder for me and made me realize that I could compete successfully with any H.S. graduates in our nation! I wanted to get into the war ASAP so, following school, I volunteered for submarine service and received further radio and sound training at New London, Connecticut. During the war, I served on the USS Whale, which was home-ported at Pearl Harbor. With only 1% of all navy personnel assigned to submarines, our submarines sank 55% of all Japanese ships during the war, incurring at the same time, the highest mortality rate among all the different military services. I had been home only a few days at the end of the war when I happened to meet one of my former school teachers. She recognized me and almost immediately asked “where are you going to college?” I informed her that I had no such plans. She then asked why I wasn’t taking advantage of the GI bill which I had not hear of until she mentioned it. I can honestly attribute the fact that I entered college in 1946 to Majorie Culver, who was my English teacher during my last year in high school. She was the older sister for the girl who had been the only one in my class that went to college following graduation. Anyhow, Miss Culver assisted me greatly in obtaining acceptance at St. Lawrence University, a prestigious school in northwestern NY. I hated to leave my girlfriend behind so we married two weeks before school started. As I had failed to notify the school that I was married, there was no rental to be found at the school or in the small town of Canton. So, the same day I reported for classes, I agreed to be transferred to Champlain College at Plattsburgh, NY, which was one of three Emergency Community Colleges that has been established for the many veterans who were taking advantage of the GI Bill. At one point during the WWII, my father had attended FBI school in Virginia so, once that I had been accepted at college, he encouraged me to become an FBI agent. I liked the idea so I informed my VA counselor at Champlain that it was my objective. However, two months later, she informed me that the VA could not support me in my goal as applicants had to have a law degree to become an FBI Agent. She explained that the GI limited to 48 months which would only provide a maximum of 5 to 7 years required for completing law school. I was saddened by this change of plans and reluctantly chose the career of a history teacher. Another two months had passed, when I was again summoned by the VA representative. This time, she had a smile on her face because she already know from my application that I was married and had incurred a disability of 30% as a result of submarine service. All she asked for was my GPA thus far. I responded “above B+”. She then gave me the freat news, i.e. that the State Board of Education would allow disabled veterans, who were married with e B+ or better average, to take a State exam at the completion of two years in college to determine if they were qualified to attend a professional school in the State. After completion of my 2nd year at Champlain College, I took the State exam and passed it in june 1948 and was awarded a certificate stating that I was qualified to attend “any law school in the State of New York”. I immediately applied to Albany Law School and, after considerable delay, was accepted. I proudly reported to school in the Fall of 1948. It was an over-crowded class as we numbered 125 and there were only a hundred seats in the room. Consequently, the overflow were placed at tables and chairs on either side of the teacher’s rostrum for the first semester. I assumed that most, if not all, had college degrees so I never discusses my pre-law days at Champlain College. I simply went to work to prove myself and was shocked when 47 of our class were handed pink slips as the end of the first semester. I recall being 62nd in the class at that time, not too far from the bottom, which was 78. We had been cautioned by Dean Cements on the first day that only about half of the class would graduate and were obviously headed in that direction. We lost another dozen at the end of the second semester so I worked even harder. I realized from the start that everyone was better prepared for Law School than I was so I probably worked twice as hard as anyone else in the class. As the Centennial Class, our graduation in June 1951 was a two-day affair and we were honored by having a host of dignitaries there including Justice Jackson of the Supreme Court who had been the Chief Prosecutor at the Nuremberg Trials. Although low, the percentage of only 61% passing in our class was higher than the overall State percentage that year. We had 74 graduates (62 from the original class) and only 43 (including me) passed the two day bar exam. Although low, the percentage of only 61% passing in our class was higher than the overall State percentage that year. I was obvious that the method by Dean Clements, i.e. concentrating on the top half of the class (first 40 in the class standing had all passed the bar), would always result in a more competitive groups in taking bar exams. In those days, Albany Law School was the leader in the State. We had only one female in our graduating class. I had taken all the tests for the FBI at the Albany Federal Office but the Korean War, which had started earlier, caused me to change my mind following graduation. I felt obligated to the government as my success to that point was all due to the assistance of the VA. As a result, I walked into the Air Force recruiting office and asked if they needed a lawyer. As the Air Force (formerly Army Air Corps) was only 4 years old at that point, the USAF commissioned me as a 1st Lt within weeks. I was asked if I would volunteer for Korea and said “yes”. Only 12 days after receiving my orders I was on a ship in Brooklyn. I had told everyone that I was going to Korea so I was shocked when the ship headed north after departing Brooklyn as I thought we were headed for the Panama Canal. Military order during wartime don’t disclose locations but did provide an APO number which I wrongly assumed was in the Far East. Instead, I ended up a week later in Wiesbaden, Germany, assigned as a military attorney, along with 24 others, as a part of the legal staff at Hqs. USAFE. At that time, we had 120 other lawyers stationed at out 60 Air Force Bases spread throughout Europe, North Africa and the New East. That assignment was the beginning of an extremely awarding 30 year career as an attorney for the Air Force. At the end of my second year there, I completed an extension course in “Foreign Affairs” given by Cambridge University. Following three year of active duty, I was employed as a Civilian Attorney in our International Law branch. Although I resided in Germany, my work was throughout the area of our responsibility, which extended to and included Saudi Arabia. During my career, I spent the first 8 years in Europe followed by 7 years at Patrick AFB in Florida, which supported all Defense activities at Cape Canaveral. After 12 years as a military officer or civilian lawyer, I left the Air Force JAG department while at Patrick AFB to become a Foreign Affairs Officer and the Special Assistant for International Affairs at the Commander of the newly organized National Range Division, which supervised defense missile operations on the Easter and Western test Ranges. The Eastern Test Range at that time encompassed 14 tracking stations, all but 1 in Puerto Rico were located in foreign countries and extended eastward to the Indian Ocean whereas Western Range extended to the Marshall islands. I resided in Florida but I travelled frequently as all of my responsibility involved activities at our foreign bases. 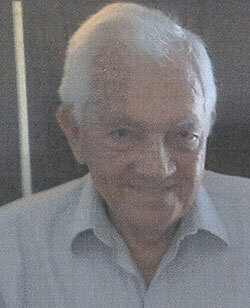 Miller at his 90th birthday in March 2014. After several years, NRD was disbanded, and I was transferred to Andrews AFB where I continued as the Director of all Foreign Affairs for the Air Force Systems Command which included both the defense ranged were under the command of General Shriever, who was responsible for developing the ICBM. After 10 year in the USA, returned to Wiesbanden in 1970 as the Director of Foreign Affairs in Europe. Essentially, my overall work involved implementation of agreements with foreign countries as well as the enforcement of all rights, immunities and privileges that were set for that were relevant to NATO countries or in bilateral agreement with non-NATO countries where we had bases. In those days, there were more Air Force bases in non-NATO countries as only 11 of the 14 NATO countries were in Europe. I never gave thought to practicing law in New York State as I loved my job in the Federal Government. Although I had achieved a high level of success as a civilian attorney, I had remained in the JAG reserve where I had been promoted to the rank of Colonel. I retired in 1982 and never hung up a shingle in the State. My three children have done well. The two boys graduated from the Naval Academy and have had good Navy careers. MY daughter is a graduate of the School of Law, at ASU. She passed the bar exams in Arizona and North Carolina where she now resides. Thinking back to my early childhood, I honestly believe that I’ve never lived “the American Dream”. I am very grateful to Albany Law School for their role in my successes in life!